In the past years, iOS apps have become more and more visually appealing. Displaying images is a key part of that, that’s why most of them use images that need to be downloaded and rendered. Most developers have faced the need to populate table views or collection views with images. Downloading the images is resource consuming (cellular data, battery, CPU, …), so in order to minimize this the caching model appeared. 60FPS => 16.7ms per frame. This means that if any main-queue operation takes longer than 16.7 ms, the scrolling FPS will drop, since the CPU will be busy doing something else than rendering UI. loading images or any file from the disk is expensive (disk access is usually from 10.000 to 1.000.000 times slower than memory access. See comparison here. If we refer to SSD disks, those can come closer to RAM speeds (like 10 times slower), but at this point no smartphone or tablet is equipped with an SSD unit. creating the UIImage instance will result in a compressed version of the image mapped to a memory section. The compressed image is small and cannot be rendered. If loaded from disk, the image is not even loaded into memory. Decompressing an image is also expensive. 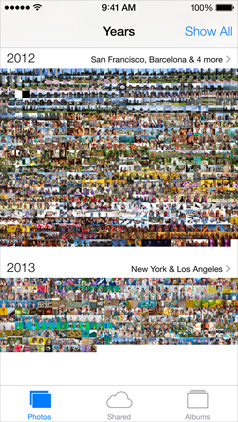 starting with iOS 7, the JPEG hardware decoder is no longer accessible to 3rd party apps. This means our apps are relying on a software decoder which is significantly slower. This was noticed by the FastImageCache team on their Github page and also by Nick Lockwood on a Twitter post. nice to have: category over UIImageView for trivial integration. nice to have: ability to process the image after download and before storing it into the cache. Here is a benchmark of image caching using Core Data versus File System, the results are recommending the File System (as we are already accustomed to). Just looking at the concepts listed above makes it clear that writing such a component on your own is hard, time consuming and painful. That’s why we turn to open source image caching solutions. Most of you have heard of SDWebImage or the new FastImageCache. In order to decide which one fits you best, I’ve benchmarked them and analysed how they match our list of requirements. Note: AFNetworking was added to the comparison because it benefits of disk caching from iOS 7 (due to NSURLCache). – for each library, I made a clean install of the benchmark app, then started the app, scroll easily while all images are loaded, then scroll back and forth with different intensities (from slow to fast). I closed the app to force loading from disk cache (where available), then run the same scrolling scenario. – please note the project from Github had to be modified as well as the image caching libraries so that we know the cache source of each image loaded. Because I didn’t want to check in the Cocoapods source files (not a good practice) and that the project code must compile after a clean install of the Cocoapods, the current version of the Github project is slightly different from the one I used for the benchmarks. – if some of you want to rerun the benchmarks, you need to make a similar completionBlock for image loading for all libraries like the default one on SDWebImage that returns the SDImageCacheType. Complete benchmark results can be found on the Github project. Since those tables are big, I decided to create charts using the fastest device data (iPhone 5s) and the slowest (iPhone 4). – SDWebImage and AFNetworking are solid projects, with many contributors, that are maintained properly. FastImageCache is catching up pretty fast with that. – looking at all the data provided above, I think we can all agree SDWebImage is the best solution at this time, even if for some projects AFNetworking or FastImageCache might fit better. It all depends on the project’s requirements. Thanks for this immensely useful benchmark Bogdan! I will be adding better image decompression to Haneke shortly (currently it only decompresses the image the first time), which hopefully should make it perform better. I didn’t understand what you meant by “from disk”. Would you mind clarifying this? Sure thing, I compared average times for retrieving images from memory cache or from disk cache. The libraries that had the best times are checked for that category, some kind of category winners. You can find the exact data I collected here http://htmlpreview.github.io/?https://github.com/bpoplauschi/ImageCachingBenchmark/blob/master/tables/tables.html. And thanks for your consideration. I see. Is this what BPCacheType does? I noticed that both FastImageCache and Haneke only log BPCacheTypeNone in the benchmark code. No, this is a bit tricky. I tried explaining in the “Benchmark app – project” section. Libraries like FastImageCache or Haneke didn’t have a way to return the cache source like SDWebImage. SDWebImage setImageWithUrl:completed: works with a completion block like this: ^(UIImage *image, NSError *error, SDImageCacheType cacheType). I modified the code of FastImageCache, Haneke and TMCache to make their completion blocks return a cachetype. But I wouldn’t/shouldn’t commit that to each project. And since I didn’t want to add the Pods sources to the repo, I was left with the only option to remove that parts of the code so the project compiles. Basically in order to re-run the benchmarks one must make the same changes as I did. I don’t get it. From what I can see, Haneke doest better than most of the others. Why SDWebImage is best solution of all time? Please clarify, thanks. Really good, IMHO, it caches the images by size so they don’t have to be resized when loaded from disk. LRImageManager could be a competitive candidate, but I didn’t include it since I was looking at wide spread projects (500+ stars) with a good contributors lists. I am making project in Xcode 4.4 and using SDWebImage. So please help to resolve this issue. Hello. I think the best way to get help is to create an issue on the SDWebImage GitHub page, make sure you write the exact error causing your issue (because that “Apple LLVM …” error is too generic and doesn’t help). Also, I suggest you upgrade to at least Xcode 5. Great article! I have a collectionview project where I’m also using cloudkit as the backend. Since CK is querying and pulling back an array of images, could SDWebImage still be used in this scenario? Thanks! You could use SDWebImage just for the caching part, meaning after you pull back images using CK, you can add them to the cache from SDWebImage. Hi again. I finally got around to implementing the caching for SDWebImage, but I realized that I’m not sure how to now populate the collectionview from the cache. Currently, I’m using the index path of the cell to index into the array containing the images, which is obviously the typical way of doing it. But how do you do that when using the cache? Is there a way to use the index path with it? Thanks! Great article! One question with SDWebImage vs FastImageCache: Why is SDWebimage _so_ much faster reading from memory but FastImageCache _so_ much faster reading from disk? I am a bit shocked to see this. We’ve been using SDWebImage, but unfortunately the library hasn’t evolved properly, IMHO. There was also once a very nasty crash for a month or so. Overall, SDWebImage served us really well, and I still have it integrated in other simple apps. Now, we decided to move to FastImageCache for our main app. Other than the performance it promises for large image sets, the way it forces you to organize your image source is a huge gain for us (think prefetching images). We’re in the middle of the migration, but I’ll hopefully find time to do our own benchmarks and shed some light at the situation. For example, library A might be sacrificing a bit of performance by doing more work in a background, low priority thread, which typically takes longer to execute, while library B lags the main thread a bit hoping to finish work quickly. This is just one of the many dimensions that would be useful to gauge. Per FIC readme, though, the library sacrifices disk space/access for butter scrolling lots of images, if done properly. So, I’m guessing the performance impact of FIC scales better than other libraries. Ultimately, of course, each use case and its requirements. Great piece, enjoyed reading it. Thanks for doing this comprehensive comparison, it really helped me decide on a caching framework. Kingfisher looks interesting, but I haven’t had the chance to try it out. I think it would worth it to redo the test on a Swift app, with Swift libraries vs Obj-c libraries. I don’t have the time to do it now, but maybe someone else will. Would love to see Kingfisher be pitted against that. Both are extremely high performance, but KFSwiftImageLoader is not just for UIImageView, UIButton, and MKAnnotationView., but it’s also the first to support  Watch as well with an extension for WKInterfaceImage and leveraging WKInterfaceDevice for device-level cache with automatic management. Do you understand what SSD stands for? Solid state drive. i.e., not a spinning magnetic disk. ALL SMARTPHONES AND TABLETS USE THIS TYPE OF “DISK”. At the time I wrote the article, there was a difference in speed between SSD disks and the regular flashdrive that the iOS devices were using (SSD was significantly faster). The SSD term (even though it’s very similar to flash drive) wasn’t used to describe the storage unit for iOS devices. I agree I didn’t made this very clear, but I don’t think your aggressive tone was necessary. It seems like the Haneke has disk cache now? Would you keep upgrading this post in the future? Excellent post i enjoyed regarding and thanks for the great comparison results which can help me in deciding which one i should go for. Have been using SDWebImage for 1+ year now, it’s very convenient esp with the progressive image download. But it’s based out of NSUrlConnection and we know that that is deprecated starting iOS 9. NSUrlSession has been around for 2+ years now and I think the future winner would be the one that implements NSUrlSession nice and right. I hope you can put it into the comparison list too. I wrote an image library: FlyImage, which takes the advantages of SDWebImage, FastImageCache and AFNetworking, is a simple and high performance image library.